This looks good. Unlike the last storm, we're actually supposed to be below freezing during the majority of the precipitation. Funny how that darned water cycle gets in the way of hype sometimes. Oddly enough, the NWS in Raleigh just revised their possible storm totals in the Triangle to 5-10 inches...which leads me to believe they now see the possibility of this storm bringing the Triangle more snow. It seems like the changeover to sleet on Saturday will happen later than expected, if at all. Status of Local Food Supplies! I stopped by the grocery store this morning. It was actually quite calm there. 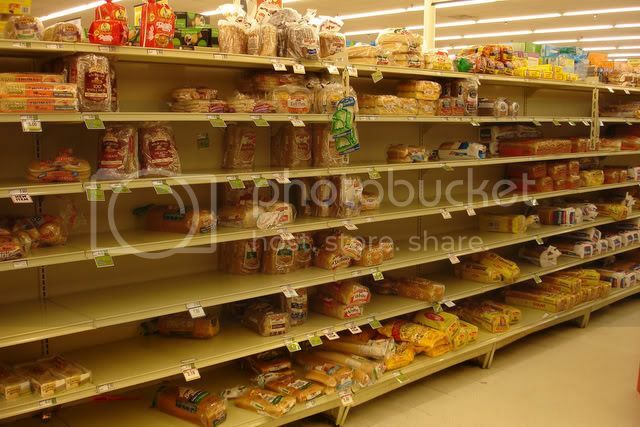 The bread supply looks like it was starting to get a little low. But there is still plenty of potted meat! NRG, you missed the bananas and milk. You always have you're camera. I know you'll be getting lot of pics of the storm coming. Can't wait to see them. We are still have no idea what to do! We are supposed to drive to Virginia tomorrow (Norfolk/Virginia Beach) for an Owl City concert. Ack!! We are from Colorado, so driving in snow is not a big deal to us. But, we know they don't clear the roads here like they do in Colorado too! What to do?? The major roads are/will be fine. There is still snow equipment here. I would just see where the freezing rain/ice boundary is, if it's doing that I wouldn't go. So, what are the odds REALLY of the power going out if we get snow? 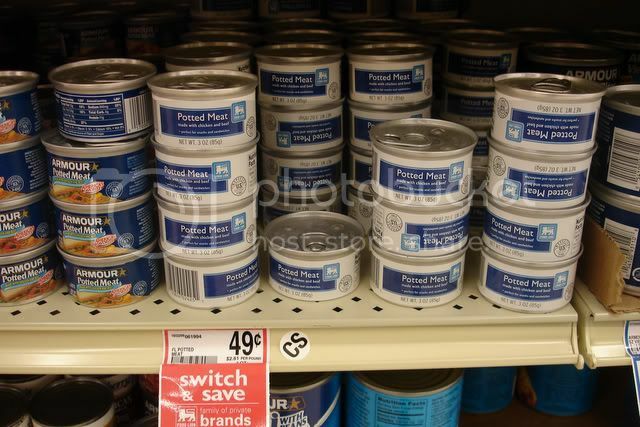 I refuse to buy anything called "potted meat." I'll either brave the roads and find somewhere with power (ie, heat), or I will huddle under blankets with my dog and eat my storm supplies of Doritos, bananas, and three-cheese semolina bread.